I read this morning the news that Radio Shack has gone Bankrupt. I guess no one really knows exactly what that will mean for their own personal favorite Radio Shack. But I recall mine. It was 1970. Somewhere in the Inland Empire, my mom took me on my first Radio Shack visit. I don’t remember why we were there to begin with. 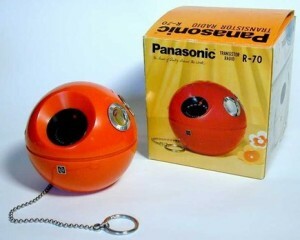 And I don’t know what we bought – except for one thing: A bright red Panasonic “Globe” radio . And even though it was softball-sized, it came with a keychain. Fast-forward a few months. It was summer of 1970. In the Secret World beneath the covers of my bed, I listened to my radio with the ear piece in so as not to alert my parents that I was still awake. I worked the tuning dial to get the best reception while the ball was out of bounds. I strained through the static, my heart stopping as Walt Frazier passed in, and Dave DeBusschere sank a shot from…I didn’t know where. I didn’t care where. I was crushed. I thought all was lost. Who had the ball? Where were they? Was anyone doing anything? and then somehow, “West throws it up…” came through my ear-piece, and in that instant I thought “Maybe”. Maybe something could happen. If anyone could make “maybe” happen, it would be Jerry West. And for an agonizing second, the announcer said nothing. The crowd noise continued as fervently as it had been. I wanted to know, I NEEDED to know. In the end, it didn’t matter. Even though his shot tied the game and sent it to overtime, the Lakers failed to capitalize on the miraculous shot. But I didn’t get to hear about their loss until the next day, however, because my shout of triumph betrayed me, and the radio was confiscated for the night. Regardless, the excitement of that night etched in me a deep respect for the power that Radio Shack could bring me. There was magic in that store. Until the advent of Youtube, I had never seen the shot, it only lived in video in my imagination. And until then, seeing that old, grainy film clip of all the other fans cheering, I believed that a little boy under the covers wishing with all his might was all that mattered.